England and South Africa were thwarted by rain on day four of the second Test at Headingley, which looks to be heading for a draw. Kevin Pietersen fell for 149 to the second ball of the day but Matt Prior's 68 pushed England to 425 all out, a first-innings lead of six. South Africa had just begun their reply when over an hour was lost to rain. 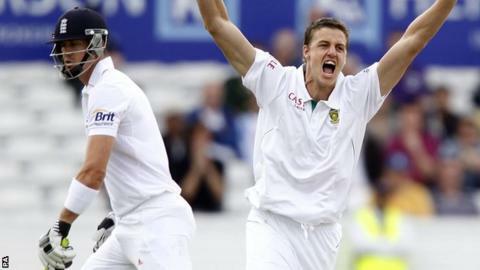 Jacques Rudolph (21) and Graeme Smith (17) had taken the Proteas to 39-0 when the rain returned to curtail the day. England keeper Matt Prior said: "There are probably only now two results - a draw or an England win, and for them to know they have to bat out a day can sometimes be quite tough. "We have to come very hard at them in the morning, we need a bit of luck, a lot of skill but who knows. "England had a real chance to put South Africa on the back foot on the fourth day at Headingley, an opportunity that they missed. Cricket is a game of changes and you have to seize the moment when it arrives." "Hopefully it will be a lovely overcast day all day, hoop around and we'll pick up 10 wickets and whoop and holler and party the night away." England lost their centurion Pietersen without addition to his overnight 149 when he pushed forward in defence but missed and was lbw to Morne Morkel. Prior continued the counter-attack nonetheless with a Pietersen-style rush of boundaries, four among 23 runs off 13 deliveries. But Tim Bresnan and Stuart Broad could add only 10 between them, respectively caught at slip off a good ball that held its line from Vernon Philander and mis-pulling Imran Tahir to be well held by substitute fielder Faf du Plessis. Prior was still able to pass an important 66-ball half-century, which ensured Pietersen's very good work was not entirely squandered. James Anderson helped the wicketkeeper edge England ahead, before Prior holed out sweeping at Tahir (three for 92). Then Anderson missed an attempted slog-sweep in the same over from the leg-spinner, as Tahir followed his earlier toils by taking the last three wickets in 13 balls shortly before lunch. England's prospects of putting South Africa's second innings under pressure were enhanced by injury niggles for key batsmen. They meant opener Alviro Petersen (hamstring strain) and all-rounder Jacques Kallis (back spasm) could not bat in their preferred positions, having not taken the field in the morning. Smith, who hurt himself retrieving a ball in the outfield, was fit to bat - but with strapping on his sore left knee. Rudolph was the captain's makeshift opening partner, and the left-handed pair were largely untroubled if subdued to withstand all that England's four-man pace attack could muster against them. A surface which had begun on Saturday to offer variable bounce did not offer rewards for Anderson, Broad, Bresnan and Steven Finn. They passed the bat regularly, but when the edge was found - most often Rudolph's - the ball invariably went to ground long before it reached the slip cordon. England know something extraordinary will be required on Monday for their team to have any chance of series victory when they head to Lord's next week for the final Test.